One such individual, whom I have touched upon previously in an early Longshot article, was Emily Frances Linfield. She caused untold embarrassment to her family, mainly through her habitual drunkenness, and was even accused of murder when her elderly mother died after a fall. This article explores her life in more detail and updates her story in the light of more recent information. Emily was born in Tunbridge Wells, Kent in 1847, being the eldest daughter of Henry Linfield, an Excise Officer, and Mary Emma Hedigan, who were married at the Registrar’s office in Tonbridge on 29 August 1846. Although born in Croydon, Surrey, Henry’s family originated from West Sussex, his father being baptised at Nuthurst in 1796. Henry, born in 1824, was eleven year’s younger than his wife, who was born in Limerick, Ireland in 1813; tragically, at the age of two, Henry’s mother Mary died after giving birth to twins, James and Sarah, who also died soon after. Henry and his older brother, William, born in 1822, were brought up by their father, also called Henry (1796-1873). They moved to Guildford in the 1830s, where Henry worked as a clothier at premises in Chapel Street. As soon as he was old enough, Henry assisted his father with his work, whilst his brother William was apprenticed to Charles Hollis, a tailor in High Street. Henry senior married for a second time in 1842; she was a widow, Harriet Ann Plumridge (née Field), and soon after, at the age of 19 in 1843, Henry embarked on a new career as an Excise Officer. that Henry Linfield, Born at Croydon, in the Parish of Croydon, in the County of Surrey, in Surrey Collection, is a likely man to make a good Officer: he is healthy and active, without any apparent bodily infirmity, and not incumbered with Debts, is a Single Man, Aged 19 years, of a respectable Character, he hath been bred a Clerk, and humbly desires to be instructed by James Hopgood, Officer of Guildford Division, Guildford District, and Hants Collection. By your Honours letter of the 6th May instructing Mr James Bull Supervisor of Guildford District Hants Collection, to Inform me to take great pains to improve my hand writing and that a Specimen of the same be forwarded to your Honourable Board when I was qualified for has (sic) an Officer of Excise. I humbly beg to transmit this letter as a Specimen of my hand writing and trusting from the attention paid that such an improvement has been made to meet your Honors satisfaction which will be my constant study to pursue. (The letter has been stamped ‘Excise July 25’ with the word ‘Pass’ written next to it). These are to certify that Henry Linfield born at Croydon in the Parish of Croydon in the County of Surrey, in Surrey Collection, Aged nineteen years, is instructed pursuant to your Honors order bearing date the 6th May 1843 and is qualified for Surveying Brewers, Maltsters, Chandlers, Soapmakers, Papermakers, and Brandy Dealers, he can cast Excise and Malt gages both by pen and rule hath taken gages and stocked for six weeks in Guildford Division and duly entered his surveys in Books prepared by him for that purpose from which he hath made true vouchers and Abstract, is provided with proper instruments and instructions and in every respect well qualified for the Employment of an Officer of Excise. I have examined the above mentioned Henry Linfield, and find him well qualified in every Respect, according to the above written Certificate; he understands the first four Rules of Vulgar and Decimal Arithmetic; he hath made the Declaration in lieu of the Oath of Office and allegiance and the said Certificate and the above Declaration are of his own Hand writing. After their marriage in 1846, Henry and Mary set up home in Calverley Place, a fashionable development on the Calverley estate where elegant houses and shops were built from 1829 to the designs of well-known architect Decimus Burton. They were built to be ‘suitable to the reception of genteel families’. Henry and Mary had three children, all daughters, born between 1847 and 1853. After Emily in 1847, Mary Matilda was born in 1850 and Anna Rose in 1853. Sometime during the mid to late 1850s, Henry and his family leave Tunbridge Wells and move to Brighton, where they set up home at 38, Montpelier Street. Perhaps the move to Brighton was a new posting for Henry, but by 1861 he has changed jobs and is now working as a Wine Merchant’s clerk. They were also providing lodgings and at the time of the 1861 census, Victoria Lecure, a Professor of French is staying with them. In the local directory, they also started to advertise from 1862 as a lodging house. We have no firm evidence of what caused Henry to leave the service, but perhaps he was just finding it too arduous and unrewarding, and there are many reasons as to why this could have happened, as previously discussed. Perhaps he was exhausted by the long hours, the disappointing remuneration and possible hostility from the people he was dealing with. On the other hand, he may have been dismissed for a misdemeanour. Interestingly, Henry’s father and step-mother are also living in Brighton at 27, Gardner Street, next to the Dorset Arms public house. This particularly busy thoroughfare was full of shops and small businesses – Henry senior is now trading as a hatter whilst his wife Harriet is a dressmaker and milliner. They also have Harriet’s niece and grand-nephew living with them. It would be interesting to know which family came to Brighton first – undoubtedly the expansion of Brighton as an important seaside resort had opened up new opportunities, evidenced by the rapid increase in the town’s population during the 19th century. In the meantime, Henry’s older brother William had moved to the neighbouring seaside town of Worthing with his wife Ann Caesar, whom he married in 1850, setting up as a Master Tailor in South Place. He met Ann, from Godalming, when he was working at Guildford, possibly at the time she was employed as a servant at Wintershall House in Bramley, home of the Barratt family. William Linfield (1822-92) of Worthing. 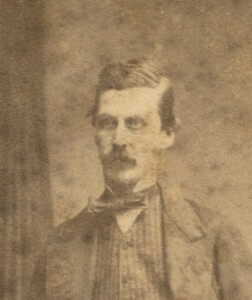 Older brother of Henry Linfield, uncle of Emily Frances Linfield. It is difficult to know exactly when Emily started to ‘go off the rails’, but all the family would have been seriously affected by Henry’s death from pulmonary tuberculosis in 1867 at the age of 43. He died at home on 11 August 1867. Sadly, this was a common enough cause of death in the 19th century, with over four million people in England and Wales succumbing to the disease between 1851 and 1910. Henry could have picked it up anywhere, the infection being transmitted by the inhalation of contaminated air droplets, possibly from a careless cough. Somehow or other, he had been exposed directly to the disease but whether it had happened whilst he was working in Kent or later on in Brighton is unknown. According to his death certificate, he had contracted the disease some years before, so the family move from Tunbridge Wells to Brighton may well have been undertaken on health grounds, enabling Henry to benefit from the purer seaside air. Eventually the disease took a hold and started to affect his lungs. The family must have found it very difficult watching him waste away in front of them; pale and anaemic, Henry would have been constantly coughing and feeling very unwell. Eventually, he caught pneumonia and the decline would have been rapid. It was fortunate that no-one else in the family became infected, but the main causes of rapid transmission were the presence of certain conditions, usually poverty, malnutrition and overcrowding. Montpelier Street, built in 1845, consisted of good quality houses with adequate living space, and the Linfields, though not wealthy, probably lived reasonably well on Henry’s salary and the extra income they received from taking lodgers. After her husband’s death in 1867, Mary and her daughters remained in Brighton for a number of years, presumably in reduced circumstances after the loss of the main bread winner. In 1873, Henry’s father died at the age of 77 and, at the time of his death, was caretaker of an unfurnished lodging house in Marine Parade. 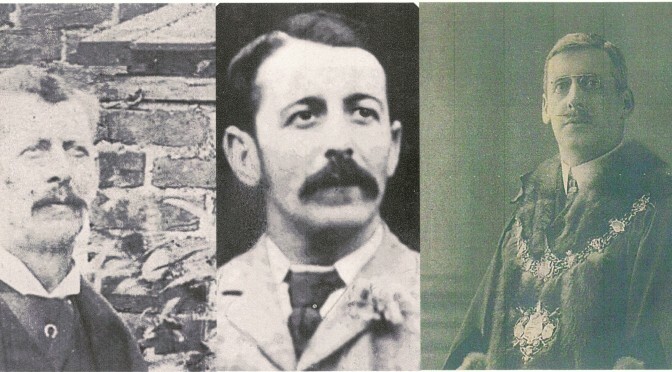 His widow Harriet lived in Brighton right up until the time of her death in 1897 at the age of 88, continuing to work as a dressmaker and milliner until old age forced her to stop. Sadly, it looks as though she lost contact with her husband’s family as she ended her days in the Brighton workhouse. Her step-son William died in Worthing in 1892, but whether they had ever kept in touch after his father’s death is impossible to say. By 1881, the family had all left Brighton and their situation had significantly changed. 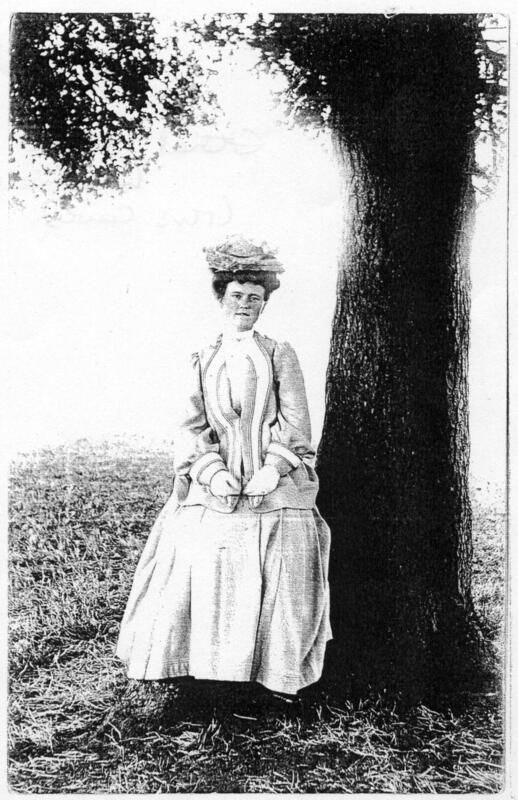 In 1874, the youngest child, Anna Rose married Henry Spencer Woodhouse at Chorlton in Lancashire. Henry was a Civil Engineer, who by 1881 is described in the census as ‘Master Engineer, employing 70 hands’. The mystery is how the couple met in the first place, but Henry was living in Middlesex in 1871 where he was born in 1848. Perhaps Anna had moved to the area to find work and somehow or other they met and fell for each other. On the other hand, they could well have met in Brighton: interestingly, according to the 1861 census, there was a 13 year old pupil living at a boarding school in Belvedere Terrace, a few streets away from the Linfields, by the name of Henry Woodhouse. He was born in London, but I cannot be certain they are one and the same. However, there is no firm evidence which proves it could not have been him. Luckily there is a clue as to when the family left Brighton. Page’s Directory for 1875 is the last edition carrying an advertisement for ‘Mrs. H. Linfield’s’ lodging house at 38, Montpelier Street. In the census of 1881, Mary is living with her youngest daughter and her son-in-law at Withington in Lancashire, no doubt assisting her daughter with the care of her young children. By now Henry and Anna had four children, Emily (4), Enid (3), Anna (2) and Harry (10 months). Mary is now aged 67. In the meantime, Emily Frances appears to be doing fairly well for herself. At the time of the 1881 census, she is recorded as a hotel manageress, living at Herne Hill in Lambeth. By 1891, she has moved to Chorlton on Medlock in Lancashire, presumably to be near her mother and sister; still a hotel manageress, she is lodging with her mother at the home of Caroline Hopson in Rumford Road. Her mother is now 78 years of age, so maybe Emily is also helping her in a care role. It is during this decade that everything starts to go wrong for Emily and she starts to drink heavily. Perhaps she already had a fairly long-standing drink problem from her many years in the hotel business. But by 1901, she and her mother have moved to Warwick Street in Worthing, where they are lodging with John Oliver and his family at no. 7. By all accounts, Emily could be very caring and kind to her mother, but her habitual drinking was to reveal a different side to her character. It was during their time in Worthing that Emily’s name sporadically appears in the local paper when she is brought before the local court for offences of drinking and begging in the streets. She is referred to in various ways in the press: a ‘female inebriate’, a ‘garrulous visitor’, and a ‘troublesome visitor’ are among a number of descriptions. Emily Frances became a real nuisance to her mother when she constantly pestered her for money to spend on her addiction. However, there are one or two errors in the reporting – it states, for instance, that in desperation to get away from her, her mother came to Worthing in October 1902, where she took up lodgings in Warwick Road. Somehow or other, Emily eventually managed to track her down and continued to extract money from her to finance her squalid drinking binges. These details are fairly suspect because they were both already living at 7 Warwick Street at the time of the 1901 census. Apart from Emily’s frequent prison sentences, she appears to be staying with her mother for most of the time. Although the date has to be incorrect, it is quite possible in the circumstances that Mary Emma Linfield originally came to Worthing in the 1890s to get away from Emily who eventually tracked her down. If this was the scenario, then she was probably too old to try and get away from her again – and Emily would have provided some company and support for her, at least when sober. Mary Emma Linfield was 90 years old on 2 February 1903. However, what attracted the full attention of the newspapers was her death on 1 May after a fall in suspicious circumstances. The Coroner’s Court had to consider an accusation by witnesses that Emily had deliberately pushed her mother during a row over money. She broke her leg in the fall, which, according to the doctor, accelerated her death which he attributed to bronchitis and heart failure. The first witness, Eliza Jane Oliver, the landlady, claimed that on the evening of 1 May, she had been listening to the conversation between mother and daughter which was taking place behind the locked door of her room. Emily had been asking for money, as usual, which her mother had refused. ‘Emily Linfield then pushed her mother and told her to ‘take that!’ and she heard Mrs Linfield fall and then begin to cry’. Despite knocking on the door several times, Emily refused to open it until she threatened to have it knocked down. Her mother was sitting on the bed, and told her she had fallen down. However, a week afterwards when lying in bed she said ‘Emily pushed me down, but she does not want me to say so to anyone, because they would be on to her’. Mrs. Oliver’s nephew, Edward Knight, also gave evidence. He had heard Emily Linfield say to her mother that ‘she ought to be kicked to death’. He afterwards heard her say ‘Take that!’ and heard her fall and cry. The inquiry was adjourned so that Emily could be called to give her own version of events. She was subsequently brought over from Lewes Prison, where she was serving a term for being drunk again. Called to give evidence, she stated she was the eldest daughter of the deceased, Mary Emma Linfield, whose husband, a wine merchant’s manager, had lived in Brighton. On the evening in question, she had been sitting in front of the fire with her mother. Her mother dropped her handkerchief a number of times, and Emily had warned her to be careful since she could catch it alight and burn herself. On getting up to lie on her bed, her mother again dropped her handkerchief and Emily had once more cautioned her. But her mother knocked her in the chest with her elbow, remarking ‘Don’t Bother!’ Annoyed at this, Emily had jerked her with her elbow in return, but, being very weak on her left leg, it gave way beneath her and she fell. Emily then denied that they had been quarreling or that she had said ‘Take that!’ to her mother. She had not bolted the door either. She had called Mrs. Oliver to help after the fall, and she had never heard her mother say anything in her presence about her pushing her. She then related how her mother had suffered a fall at Christmas, and on several occasions since, thereby further weakening her left leg. It now came for the Jury to decide the outcome of the case. Had Emily deliberately pushed her mother down, as the witnesses claimed, or was the fall an accident? After deliberating for some time, they requested another daughter of the deceased might be fetched, in the hope that she could throw more light on the cause of the accident. The daughter stated that she came to Worthing about a week after the accident. Her mother had intimated nothing at all to her about being pushed by her sister. The ‘daughter’ is not named by the newspaper but was probably Emily’s younger sister, Anna Rose Woodhouse. Her other sister, Mary Matilda, completely disappears from the records after the 1871 census when she is still living with her widowed mother and sisters in Brighton. The Jury rejected the contradictory evidence of the landlady and her nephew, and returned a verdict of ‘Death from heart failure and bronchitis, accelerated by the fall.’ As for Emily Frances, she stayed in Worthing for a while, still a ‘troublesome visitor’ who continued to drink and beg in the streets. Since her mother’s death, she had nowhere to stay since she was unable to afford lodging and spent much of the night wandering the streets and living rough. The Worthing Gazette reported her appearance before the Worthing Bench again on 6 January 1904 on a charge of ‘begging alms’ in West Buildings, when she was the worse for drink. Yet again, she was sentenced to seven days’ imprisonment at Lewes. Rather intriguingly, her cousin Arthur George Linfield, Fruit Grower, also appeared before the Worthing Bench later in the same year on a summons for non-payment of rates. Arthur was among a group of alleged defaulters’ who stated in explanation of his failure to pay £1 13s 4d, a proportion of the poor rate, that as a Nonconformist he was making a stand on what he regarded as the injustice of having to pay for the education of children in Church of England schools. But they lost the case and had to pay a fine. At least his appearance was on a matter of principle! Emily’s antics threatened to cause her Worthing cousins acute embarrassment, especially as they were well respected in the town. As the children of her father’s older brother William, who came to live in Worthing in the 1850s, they were first cousins. Frederick Caesar Linfield (1861-1939) was an Alderman on the local borough council, a well-known local businessman and champion of the Primitive Methodists. He was also a teetotaller and firm supporter of the Temperance movement, which would hardly have endeared him to his cousin’s drunken behaviour! His two brothers were equally esteemed: William Henry Linfield (1854-1923) was Relieving Officer in the service of the East Preston Guardians and also Registrar of Births and Deaths. In this capacity, according to his daughter Ethel, who remembered seeing Emily Frances in the Relief Office, her father ‘refused to own her’ but she was given parish relief of 6 shillings. Arthur George Linfield (1859-1938) was a pioneer of the glasshouse industry in Worthing, on the board of the East Preston Guardians and a leading light in the local Wesleyan Methodist circuit. Whether any of them were subject to any sort of ridicule within the local community is unknown, but at least the local newspaper refrained from revealing the close family link between them and their wayward cousin. Emily may have moved to London at some point because in 1911, she is serving a sentence in Holloway, the first all-female prison in England. Persistent offenders were often sent to Holloway to serve short sentences for minor offences such as drunkenness or petty disorder. By 1911, she was 64 years old and her occupation is described as ‘needlework’. On a recent occasion Emily Frances Linfield was sentenced by the Local Bench to seven days’ imprisonment for begging. Within the past few days she has been brought before the Brighton Bench on a charge of being drunk and incapable, the penalty being 19s 6d., with the alternative of fourteen days at Lewes. It was stated that there were sixteen previous convictions against her. She has been an inmate of an Inebriates’ Home for two years, but refuses to go to such an institution again. She may have decided to return to Worthing as she was so well-known in Brighton for her antics that she was finding it more difficult to escape the attentions of the local constabulary. She probably spent most of her remaining years in the Brighton area, sadly, though not surprisingly, ending up in the workhouse at 250, Elm Grove. Yet, despite the decades of heavy drinking, she lived to be 84 before dying in 1931. Cause of death was given as senility and paranoia. No doubt her Worthing cousins were greatly relieved when she finally left the town, although I expect there was always a nagging fear she could just as easily return out of the blue. What we don’t know, of course, is whether any of them had initially tried to help her when she came to Worthing. Perhaps they had, especially as they were all resolute Methodists – and closely connected with the East Preston Guardians. However, in many ways Emily was her own worst enemy and any financial help she may have received would have been spent on alcohol. So whatever assistance she may or may not have been given, it would all have been to little avail. Sadly, she probably had a mental illness which was completely unrecognised in an age of much less empathy and understanding than our own. So she would not have been regarded as a victim of alcohol abuse, but the architect of her own misery and downfall. What did she do in all those years until her death? No doubt the drinking and begging continued and she served more time in prison. She must have been a lonely and pathetic figure; things may have turned out better for her had she not lost her father from tuberculosis at the age of 43. It is not known why she embarked on such a self-destructive path, and like many hundreds of thousands of others in the Victorian age, she succumbed to the temporary oblivion of her own misery. All in all, a very sad human being – but certainly deserving of more sympathy than she received – although I suspect she was obstinate, infuriating and frustratingly difficult to reason with… in other words, her own worst enemy.